As a training centre, GHR has to promote analysis and reflection. Thus, it regularly convenes in Geneva lectures and brainstorming on the main issues dealt with by the Human Rights Council. Groups of diplomats, scholars, civil servants and defenders are invited to attend GHR brainstorming sessions. 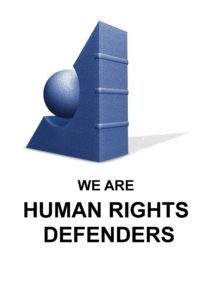 Human Rights defenders and organisations in the regions face specific problems. They have their own needs and priorities, which should be discussed at international level. This expert meeting was convened jointly by the Geneva Center for Security Policy (GCSP) and Geneva for Human Rights. The Permanent Missions of Argentina and France co-sponsored the event focusing on the universal ratification of the International Convention. Most of the members of the Committee on Enforced Disappearance attended, as well as experts form OHCHR, the Human Rights Committee and several international NGOs. To prepare the ‘World Conference on Indigenous Peoples‘, GHR held In March 2014 an Expert Seminar to review UN achievements and to strengthen UN protection mechanisms and procedures for indigenous peoples. The World Conference took place in New York in September 2014. The Conference invited the HR-Council to review existing mandates to improve the Expert Mechanism on the Rights of Indigenous Peoples (EMRIP). In April 2016, OHCHR convened an Expert Workshop on the follow-up to the World Conference. The proposals to strengthen the EMRIP were reviewed in GHR Expert Seminar of 11 July 2016. The mandate of the EMRIP was substantially broadened by the September 2016 resolution of the HR-Council. Both the Outcome Document of the 2014 World Conference and the HR-Council 2016 resolution focused on the implementation of the UN Declaration on the Rights of Indigenous Peoples (adopted by the General Assembly in September 2007). ‘Indigenous Peoples: Implementing the UN Declaration’. Co-sponsored by the Delegations of Guatemala and Mexico, and chaired by Kenneth Deer (Secretary of the Mohawk Nation at Kahnawake, Canada), it took place in Palais des Nations on 14 July 2017. Dorian Oldemar Flores Andy (Kichwa, Comuna San Jacinto Depindo, Ecuador). Maina Talia (Vaitupu, Tuvalu Climate Action Network, Tuvalu). Chief Wilton Littlechild (Cree, Canada, former Chairman of the EMRIP). 67 persons attended, including delegates from a dozen of States. The debates highlighted that implementing the UN Declaration did not depend only on the most efficient ways to use the current UN mechanisms and procedures, in particular the broadened mandate of EMRIP, but also on the analysis of existing gaps in the protection of indigenous peoples in the field. See also here above under Implementation Programme. Many States either abolished the death penalty or observe a legal or de facto moratorium on its use. However, only 81 States ratified the Second Optional Protocol to the International Covenant on Civil and Political Rights (ICCPR), by which they accepted the legal obligation of abolishing the death penalty. As the Human Rights Committee, during its 117th session (20 June to 15 July 2016) continued its examination of a draft General Comment on ICCPR Article 6 (Right to Life), GHR convened a High Level Expert Seminar to promote the universal ratification of this protocol. Eight Permanent Missions co-sponsored the Seminar: Liechtenstein, Argentina, Brazil, Namibia, Mongolia, Belgium, France and Italy. The event took place on 22 June 2016, from 3 to 6 pm in Room XVII of the Palais des Nations. 75 persons attended, including diplomats from 17 Permanent Missions. The Expert Seminar was opened by two Ambassadors: Peter Matt of Liechtenstein, spoke on The Right to Life, and Madam Elisabeth Laurin, of France, on The abolition of death penalty. Key-note speaker was GHR member Prof. Marc Bossuyt, former Rapporteur of the Sub-Commission on Death Penalty, currently member of the CERD. He reviewed the historic context of his draft and the contents of the optional protocol. Ambassador Regina Maria Cordeiro Dunlop, Brazil. Ambassador Bertrand de Crombrugghe de Picquendaele, Belgium. The session concluded with comments from Ambassador Serra. The third session on strategies for universal ratification, was introduced by two experts: Marianne Lilliebjerg, Deputy Director, International Advocacy, Amnesty International, explained Amnesty’s position and work planning. And Prof. Sir Nigel Rodley, co-Rapporteur of the Human Rights Committee on the Rights to Life and President of the International Commission of Jurists, commented on the trends regarding the abolition of the death penalty. The Seminar concluded with remarks of Prof. Marc Bossuyt and the traditional brainstorming dinner, during which a dozen of participants shared views with three members of the Human Rights Committee. In 2014, to prepare the ‘World Conference on Indigenous Peoples‘, GHR held an Expert Seminar to review UN action and to strengthen UN protection mechanisms and procedures for indigenous peoples. The World Conference took place in New York, on 22-23 September 2014. It invited the HR-Council to review existing mandates to improve the Expert Mechanism on the Rights of Indigenous Peoples (EMRIP). To prepare this review, OHCHR convened a Workshop (April 2016). GHR organized an Expert Seminar on the strengthening of the EMRIP before the HR-Council would decide in September 2016. It took place on Monday afternoon 11 July 2016 in Room XXV of the Palais des Nations, was chaired by Kenneth Deer (Mohawk Representative, Coordinator Indigenous Caucus in Geneva), and co-sponsored by the Delegations of Guatemala, Mexico, Canada and Norway. Kenneth Deer opened the Seminar. He stressed the importance of this consultation for the future of the EMRIP. Representatives of Guatemala, Mexico and Norway outlined the position of their countries. The key-note address was made by Adrien-Claude Zoller on the existing UN mechanisms and procedures regarding indigenous peoples. Kenneth Deer opened the second session on the strengthening of the mandate of the EMRIP. He listed the proposals made so far by States and indigenous organisations. Three speakers outlined the main challenges: John Henriksen (International Representative Sami Parliament of Norway), Lola Garcia-Alix (International Work Group for Indigenous Affairs, Copenhagen), and Karla General (Indian Law Resource Center, Washington). They all insisted on the need to implement the UN Declaration on the rights of indigenous peoples. The last part of the Seminar was devoted to a debate with the participants. The main issues raised concerned the broadening of the mandate of the EMRIP, the possibility to receive complaints, to undertake field-visit, to provide technical assistance to States, and the requirements to become a member of EMRIP. With the support of the Dutch Government, GHR previously held two Experts Seminars on the freedom of religion or belief. In 2012, the focus was on the evolution of the debate in the UN on the right to freedom of thought, conscience and religion. Theme of the 2015 Seminar was Religions and Gender-related rights. GHR also conducted specific courses on the freedom of religion, both in Geneva and abroad. This issue remains a priority of GHR. In 2016, GHR was involved in two follow-up conferences. During the 31st session of the HR-Council, Adrien-Claude Zoller moderated the side event convened in the Palais des Nations by the Delegation of the European Union and the Permanent Mission of the Netherlands on the title: ‘Twin Rights’: the Interdependence of the Freedom of Religion or Belief And Freedom of Expression. Welcoming addresses were made by Peter Sørensen, Head of the EU Delegation in Geneva, and Roderick van Schreven, Ambassador of The Netherlands to the UN. The panellists were Heiner Bielefeldt, Special Rapporteur on Freedom of Religion or Belief; Frank La Rue, Executive Director of Robert F. Kennedy Human Rights Europe; and Ms. Diane Ala’i, Representative of the Baha’i International Community to the UN in Geneva. About 150 persons attended. religion or belief, the panel discussed the recommendations put forward in the Special Rapporteur’s latest report in relation to recent developments, such as the Rabat Plan of Action and the shared roles of the ‘twin rights’ in combating intolerance, discrimination and violence in the name of religion. Sexuality’ organised in the Palais des Nations by the UN Special Rapporteur on Freedom of religion or belief and Muslims for Progressive Values (8 -10 June 2016). The conference discussed in particular the misunderstanding of freedom of religion or belief and sexuality, violence in the name of religion against individuals based on their sexual orientation, and expression of sexuality in public religious life. It began with keynotes addresses from the Prof. Heiner Bielefeldt, Ms. Ani Zonneveld (Muslims for Progressive Values) and OHCHR Director Ms. Peggy Hicks. 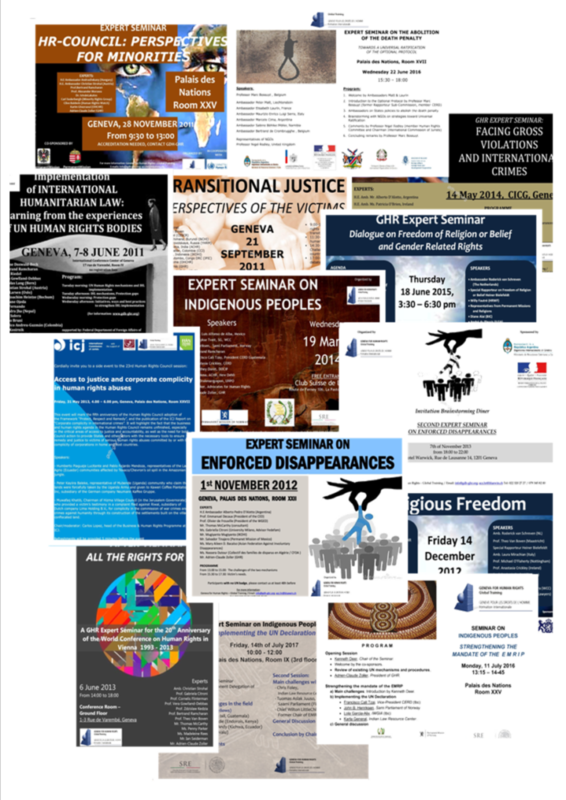 The lack of funding prevented GHR to realize three other Seminars planned on enforced disappearances, indigenous peoples (follow-up to the World Conference) and criminal law. After the successful GHR Seminar of December 2014, a second brainstorming was required to facilitate ongoing talks in Geneva on the preparation of the first session of a new UN Working Group to envisage the drafting of a legally binding instrument for business. This Seminar was convened together with the Ebert Foundation (FES). 50 experts, diplomats and non-governmental representatives participated. Ms. Penny Parker (Minnesota Advocates, member of GHR Executive Council) chaired the session. Opening remarks were made by Hubert Schillinger, Director of the FES Geneva Office. After the key-note address of Prof. Shane Darcy (Irish Center for Human Rights), experts contributed to the debate in two panels. Gerald Staberock (director OMCT) chaired the First Round-Table on: ‘Access to Justice for Victims and Human Rights Defenders’. Panelists were Michael Ineichen (on HR Defenders, ISHR), Marie-Laure Guitlan (SHERPA), and Richard Meeran (Leigh Day). The Second Round-Table was on ‘Extraterritorial Obligations’. It was chaired by Felix Kirchmeier (FES). Two experts intervened: Ian Seiderman (ICJ), and Sigrun Skogly (Lancaster University, ETO consortium). The Seminar concluded with comments made by several delegations, including Ecuador, South Africa, France and Switzerland. As a recent report of the UN Special Rapporteur on freedom of religion or belief noted, the relationship between freedom of religion or belief and gender related rights displays many facets and is exposed to numerous political, jurisdictional, theological and philosophical controversies. Sometimes, the two human rights norms are wrongly perceived as standing in general opposition to one another, he wrote. This is why gender-related rights were the focus of GHR second Expert Seminar on freedom of religion or belief. Sponsored by the Government of the Netherlands, attended by more than 100 persons, the Seminar took place in the Palais des Nations on Thursday afternoon 18 June 2015. The Chair of the Seminar, Amb. Roderick van Schreven, Permanent Representative of the Netherlands, introduced the deliberations, which were divided into three parts. Theme of the first session was: ‘Dialogue on ‘Synergies and conflicts between of freedom of religion or belief and gender related rights’. It was chaired by Edward Flynn (Vivat International). Key-note address was made by the Special Rapporteur on Freedom of Religion or Belief, Prof. Heiner Bielefeldt. He was followed by Amb. Maurizio Enrico Luigi Serra (Italy), Ms. Diane Alai (Baha’i International Community), and Ms. Honey Tan Lay Ean (Bar Council Malaysia). Comments were made by the Delegations of Sweden, Brazil, Uruguay and the Netherlands, before several questions were addressed to the speakers. Mark Barwick (Human Rights Without Frontiers, HRWF) chaired the second session on ‘Dialogue on Overcoming religious and gender stereotypes’. The Key-note address was made by Willy Fautré (director HRWF) on ‘attempting to Bridge the Gaps’. The experts were John Fischer (Human Rights Watch), André du Plessis (ILGA), and Ms. Ani Zonneveld (Muslims for Progressive Values). The last session on the perspectives for the dialogue on freedom of religion and gender rights was chaired by Adrien-Claude Zoller (GHR). Three experts intervened: Edward Flynn, Mark Barwick, and Willy Fautré. Prof. Heiner Bielefeldt concluded the Seminar. At the end of the Summer, GHR realized another Seminar on religions, this time together with the Human Rights Centre of the University of Padova. This Seminar on ‘Religions, Conflicts and Minorities’ took place in Padova on 11 and 12 September 2015. It coincided with the meeting of the Academic Board of a new joint PhD Programme of five universities on ‘Human Rights, Society and Multi-level Governance’. The Expert Seminar was opened in the ‘Aula Archivio Antico’ by Prof. Marco Mascia and Prof. Giuseppe Giordan (both from the University of Padua). and Adrien-Claude Zoller (GHR) on ‘Trends in minority rights and religious freedom’. The Second Round-table focused on case studies and was chaired by Prof. Paolo De Stefani (University of Padua). The following experts presented an overview of the specific situation in Italy, Croatia, Greece, Romania and Australia: Prof. Giuseppe Giordan (University of Padua), Prof. Siniša Zrinščak (University of Zagreb), Prof. Stelios Perrakis (Panteion University, Athens), Prof. Costantin Preda (University of Bucharest) and Prof. Sev Ozdowski (University of Western Sydney). Other experts, dozens of students and local authorities attended.